Recent information from T-Mobile Moto X users suggests that Android 4.4.2 could be on its way to your Motorola’s soon. 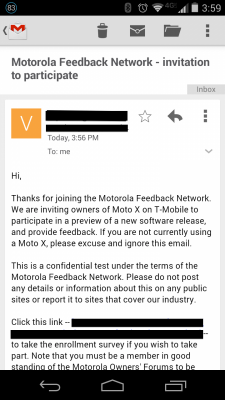 Yesterday, Android Central reported that Tmo user’s who’d signed up to take part in Motorola’s feedback network were receiving invitations to try a new version of software. The email doesn’t give any information on what version of software is going to be tested, but we’re almost certain that it’s 4.4.2. This pre-release “soak test” is a very good indication that an update could well be on its way. Judging from the fact that other carriers across the border in Canada have already been shipping the update, it’s clearly ready, and just needs to be put through the final stages of testing. Let us know if you’ve received the invitation. Boooo…no blacked out link! Not that I have a Moto X, but sorry for you guys. Dont post this on a public site…….. That worked out great. Can’t wait to try it. I’m loving my Moto X! Best phone I’ve ever used! Oooh! If it’s software that includes wi-fi calling, I might just jump on a Moto X. That would be a great thing….